This page is an archive of this blog, and is presented for historical purposes only. In the UK, the "governing body" for cycling is British Cycling. They are responsible for a vast array of organised cycling, up to and including the GB Team. Furthermore, in the last couple of years, the broadcaster Sky has become involved in sponsorship in a big way, not just the Sky pro team, but also at a more grass-roots level. 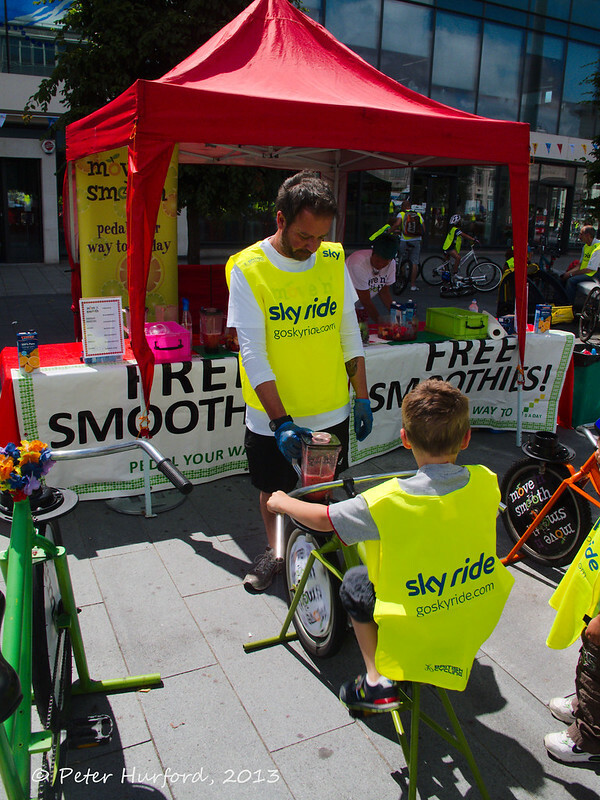 One of the results of this collaboration is....the Skyride. There happened to be one in my nearest big city, Southampton, last weekend, so I popped along with my camera (and my bike) to see what it was all about. The basic principle is that you have a shortish, closed circuit - this one was around 7.5km or 5miles and was available for four hours. The route comprised a mixture of roads and paths through municipal parks. So as not to bar traffic from the city centre completely, at certain intersections manned traffic lights were set up to alternate priority between motor traffic and cyclists. This one was a straight one-on-one sprint. 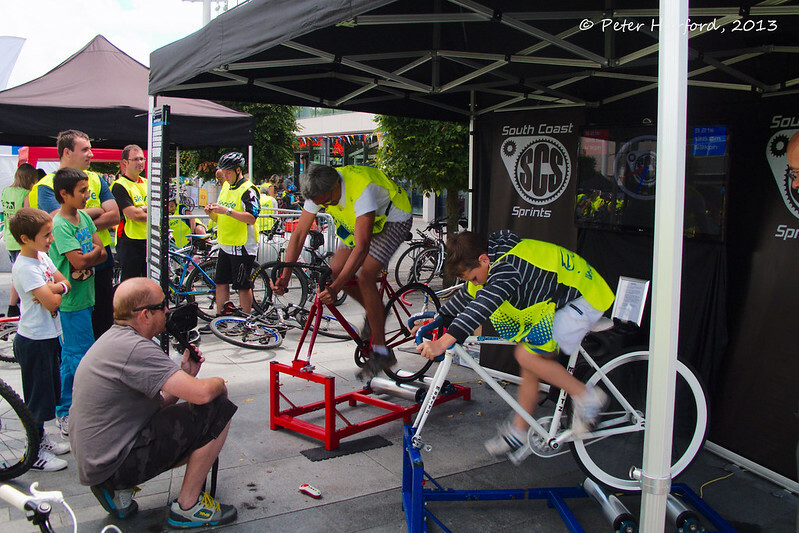 Bikes were attached to rollers, and the first to reach a set distance was the winner. So straight away, there is a lot going on which will keep kids interested. And the "family" aspect is quite central to the event. 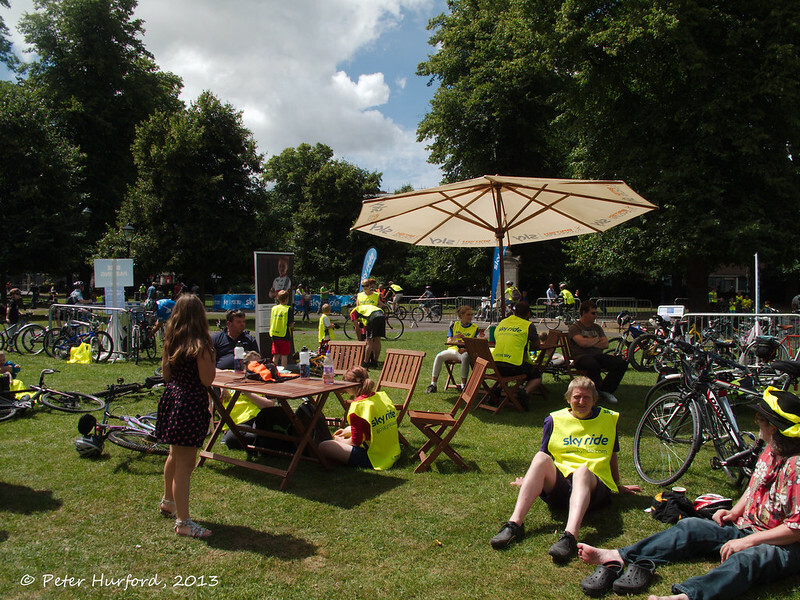 Of course, all this cycling was thirsty work, and in one of the parks was a refreshment stand, accompanied by a Sky tent and a "check up" stand run by Halfords, who are probably the UK's largest auto and bike chainstore. The blurb next to this bike said that this particular bike was designed specifically for mountain stages. 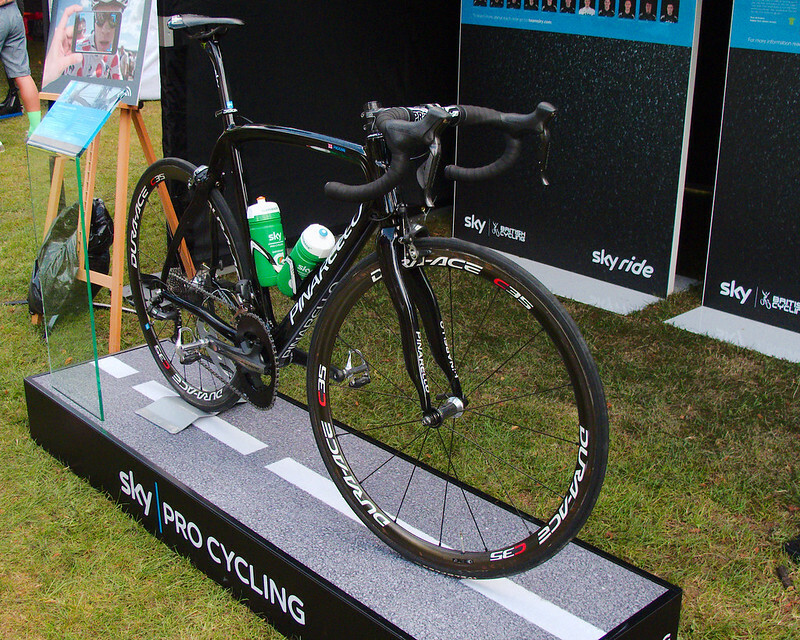 It had less paint than the normal Pinarello so as to make it as light as possible. How believable this is...... 11-speed electronic Dura Ace setup, but with elliptical chainrings. and they also had some electronic shifters/derailleurs on display - I've only ever used manual chainsets before, but the smoothness of this mech really has to be seen to be believed. Great also for nervous riders, of which my wife is one. She has seen the health benefits I've got out of cycling and would love to join in - but she gets easily spooked in traffic and never feels she has total control over the bike. The lap distance is ideal. If you're a fitter rider, you just ride more laps. We rode 2 laps, or 10 miles - by my wife's standards that's not a bad bit of exercise. Unfortunately you do see people racing to an extent, although the organisers do emphasize that this isn't allowed. But be prepared for lots of people to be around. At the event I attended they estimated there were 10,000 people (but this was over a 4-hour period. There weren't 10,000 people on the course all at once, although it did feel like it sometimes). This means that bottlenecks can and do happen, especially on narrow roads, lights or the slightest gradient, and there's nothing you can do except stop and wait. So if you're wanting to do a "proper" ride, forget it and go someplace else. This event is for fun only. In a similar vein, you have to be prepared to be riding amongst people who have no road sense whatsoever. They will pull out or block you without warning. Largely this is kids, and to be expected, but a significant proportion of grown-ups too. I can only really describe it as the closest I've felt to riding in the centre of London, without riding in the centre of London. I knew there'd be lots of people around, and also my wife is quite a slow rider, so I took my Dutch "Granny" bike, with the intention of just tootling along, and it was ideal. If I'd have taken one of my road bikes it would have been a very frustrating ride. Every summer the City of Portland closes off streets to motorized vehicles, and opens them to cyclists, walkers, runners, unicyclists, and any other human-powered transportation. This summer's events are taking place once a month from May - September, with one event in each of the city's 5 quadrants. 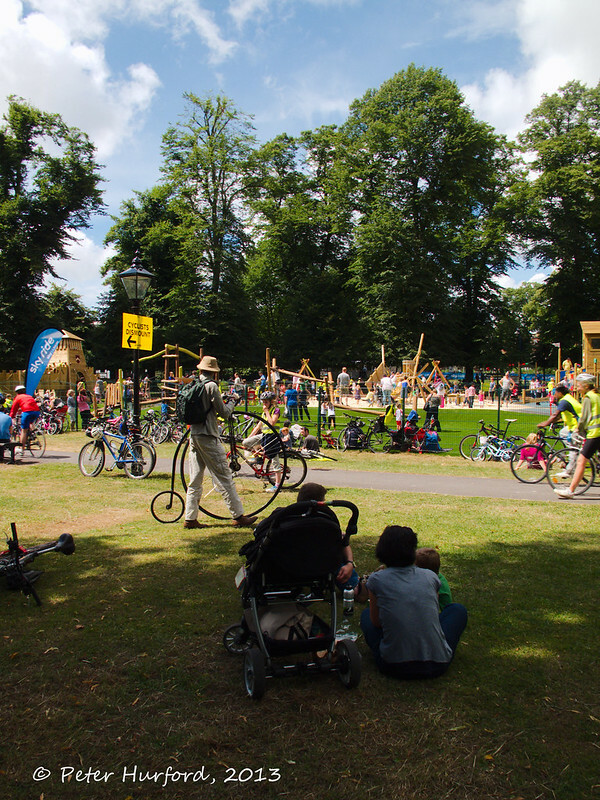 The routes each include several city parks, which are hubs for community activities during the event. Each event often has over 20,000 participants. In 2011 Sunday Parkways had 107,300 participants across all days/locations. If you visited us during the event and are wondering what exactly this site is all about, you might want to scroll on down to the bottom of this post where I've got links to some more information about how the site works, some of our more popular questions, and some of the other Stack Exchange sites. Of course, you're welcome to keep reading about our experience volunteering today! This is part 2 of a two part series. Part 1 focused on all the detailed planning leading up to parking a ton of bikes. This is about the actual event where we parked 2551 bikes. Some people had to get there at 5am to do setup, bag check, valet bike parking for last minute registration, etc. Luckily for me, the main valet bike parking that I would be dealing with doesn't really start until the first riders come back from their 30-, 60-, or 100-mile ride that they left for at 8am, so showing up at 9am was plenty of time to do some of that last minute setup (chalk, canopies, tables, putting tickets on clipboards, etc.) and to train volunteers. Some of our volunteers were regulars who only needed a little training about the differences (tickets have spots already, you have to deal with bags too, walk down wide aisles and park handlebars first, walk riders through so they see where their bike goes and direct them to the exit). 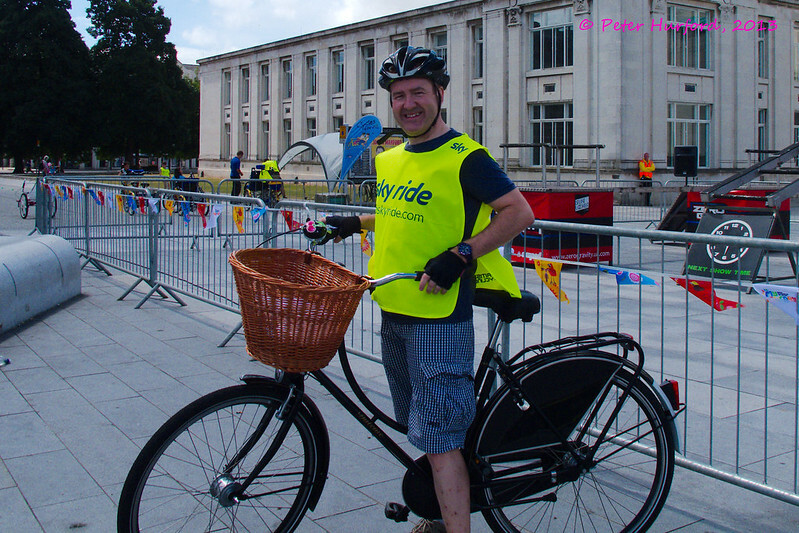 Many of our volunteers were people who had never volunteered for any kind of bicycling-related activity at all before. Some of the local high schools have a community service requirement that they were fulfilling (most of these went above and beyond! ), some were volunteering via the Gran Fondo's volunteer call and didn't know our organization. Some weren't bicycle riders at all. So, basic training emphasized being careful with the bikes, pointing out some of these bikes cost as much as a car, pointing out that one bad scratch can ruin a bike (most bikes are carbon frames), walking them through the procedures, etc. There was assigning people out to various jobs. Some people went off to help with bag intake since the electric "golf" carts ran out of batteries and bags needed to be hand carried in. There was a little bit of waiting. And then a few bikes started trickling in. I think the first bike was one with a snapped rear derailer. Around noon, before things were too insanely busy. Note the chalk marks to indicate which aisles to walk down and which not to. Then things picked up.... and picked up more... and got entirely crazily busy... At one point we were almost all full and there was a panic about not being able to find fresh tickets (with rack spots on them). I think early on a few tickets escaped without being collected, so up at the very front there were a handful of spots, so we released the 7th seats on racks for the first zone (red). I think later all of the “seven” tickets were released and many of the “eights” as well. A sea of bicycles! Picture taken from front. Note two blue canopies for the two exits about one-third and two-thirds through our area). This picture was actually taken when things were starting to slow down just a little bit, these racks were a bit more packed a couple hours beforehand. I believe we got very close to our 1085--1280 bicycle capacity. We did resort in a few cases to turning a smaller bike or two around to help squeeze one more bike into a rack, but we didn't have to do much of that and had the freedom to do it with only a small bike that wouldn't mess up the walking aisle too much. At one point, Cheryl (one of the main Bike Monkey / Gran Fondo people) came into the bike parking area and asked about finding a bag. "I've got a bib number, can you find the bag? The rider is in the hospital and unconscious." I explained that we could but it would take a long time looking at each bag. The numbers from the bag check ticket, or even just the color of the ticket would help, as would a description of the bag. I think there was some more phone calls and they got the ticket number (at first getting it as a "C" when it should be a "B"), I located the bag and it was whisked away. Later I learned the details. There's a tricky descent ending at Hauser bridge and there'd been a bit of rain out there earlier. It had been the very first rain of the season, so was chock full of extra oily slipperiness. A few riders fell down the ravine and had to be airlifted to the hospital. I was helping find one of their bags (or maybe their partner's bag?). Last I heard they were in stable condition and expected to recover fully. News article day of: 3 GranFondo cyclists seriously injured at Kings Ridge News article next day: 2 GranFondo riders remain in hospital. Note that we parked about twice as many bikes as we had capacity for, so the system for turning spots over worked out well. Line of people waiting to park their bikes or get their bikes back. Note my name-tag on my beer in lower right. The Fondo staff were good at taking care of the volunteers. We all got food tickets to get lunch from one of the food vendors (I got curry because the paella line was too long). Snacks were delivered regularly. Beer from New Belgium Brewing was delivered several times. It's possible that beer was my primary sustenance through the event. Some people worked pretty late until everything was torn down and packed away. The day was exhausting. I was totally useless the next day. Sore legs, generally tired. Another volunteer that worked only about 4 hours (I worked closer to 10 hours) said her pedometer told her she'd walked 13 miles, so I figure I must've walked a marathon (26 miles; 42 km). We've already been talking a bit about planning for next year. I figured out that the "narrow" 7 foot aisles could have been 6 feet instead because most bikes are closer to 3 feet (in front of the seat when hanging) than 3.5 feet; a little front-of-wheel overlap across racks is ok; and we really never did have to squeeze down those aisles like I thought we might. I believe that using that aisle space for parking would've gained us roughly 100 more spots (9% more, or about 18% more than a standard alternating-on-racks setup). Last year we got a lot of tips (used to fund the annual volunteer appreciation party), but this year not many. Tip jars in more spots would've helped, but I think our usual routine where they wait at the front staring at a half-full tip jar while we retrieve their bikes is more likely to get us tips than this year's routine where we escorted them through and they never stood around waiting. All of the volunteers were awesome, but we were surprised about the high school students. They could've shown up, done the bare minimum and gotten their community service credits, but most of them really worked extra hard, showed initiative in minor adjustments (like somebody to direct people into the right lines) and were cheerfully awesome once they got the hang of things. This is part 1 of a two part series. This part will focuses on all the detailed planning leading up to parking a ton of bikes. 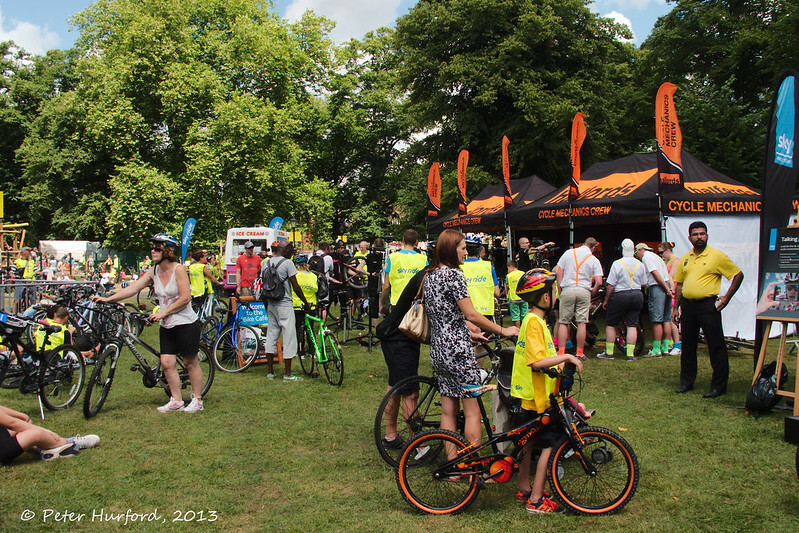 Next week will be Part 2 with the actual event where we parked 2551 bikes. I'm heavily involved in my local cycling advocacy group, and like many bike groups, one thing we do to raise money, encourage more riding, and make ourselves known in the community is Valet Bike Parking. Usually this involves parking 50--100 bikes using 3--10 bike racks (basically an 8--10 foot (3 meter) long metal pipe with legs). A few years ago, our most famous local pro cyclist Levi Leipheimer teamed up with the folks at Bike Monkey (cycling magazine and organizer of local races) to do a big organized ride to raise money for getting the Tour of California to come to Santa Rosa again, and to raise money for Levi's wife's favorite charity. The route is based on a training route that Levi uses, over 100 miles (160 km) with at least 8500 feet (2600 meters) of climbing. There's also 65 mile (100 km) and 35 mile (55 km) options, but over half the riders take the longest option. 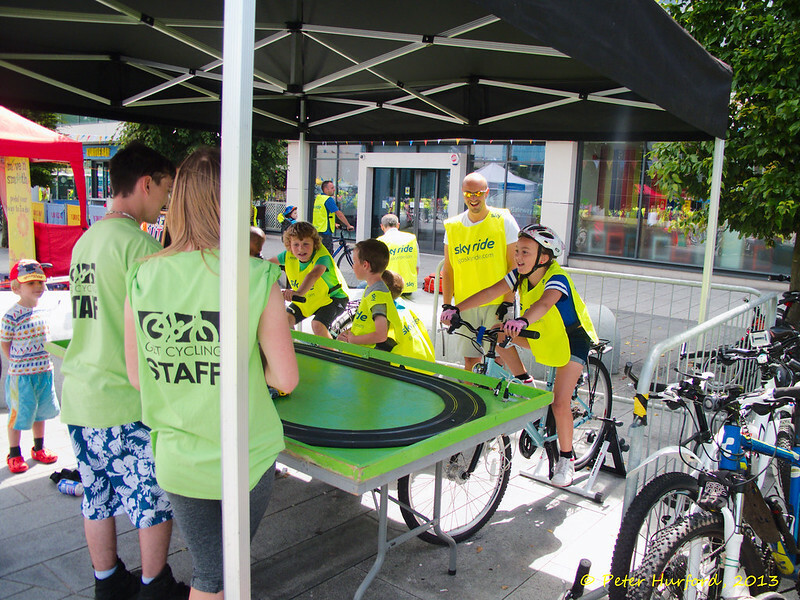 I've helped in some capacity all three years with the valet bike parking that's set up so that people can enjoy food, beer and a festival after they're done riding. This year I helped out with the planning, especially figuring out the layout. 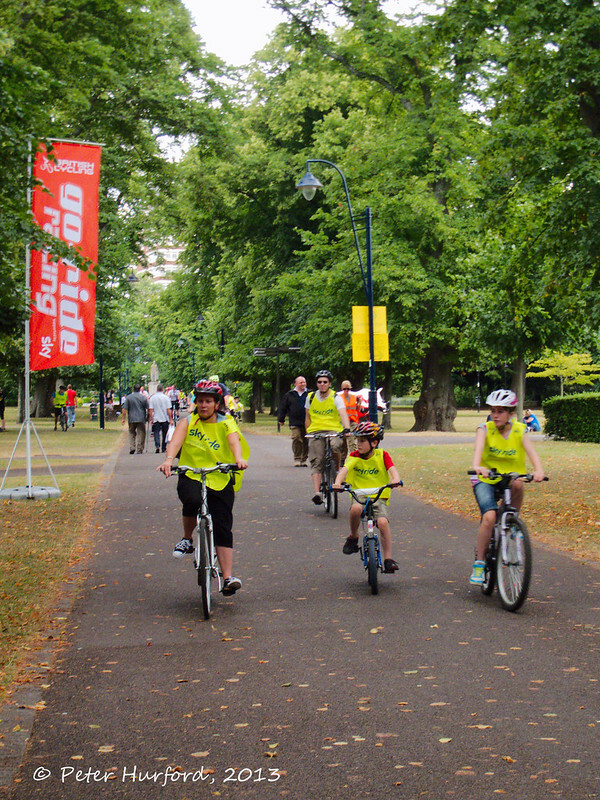 That first year there were 3,500 riders, the second year 6,000 and this year 7,500. The first year we were right next to the finish line and the festival (with the beer tent conveniently right in front of us) and parked about 1,500 bikes: more than we'd ever parked at any other event. 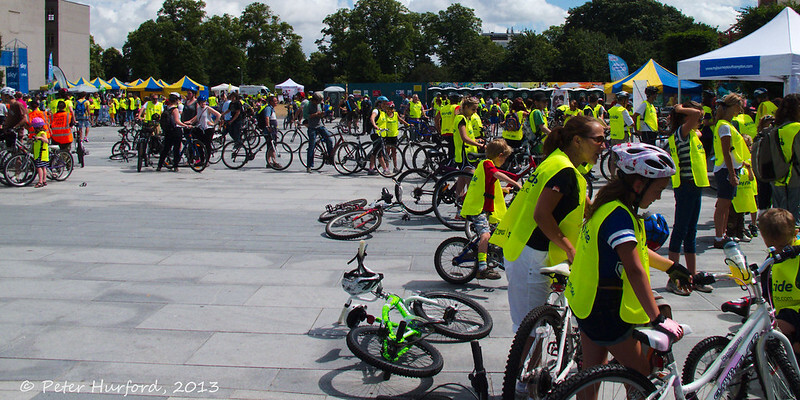 We ran it similarly to how we'd run an event parking 100 bikes, just with more space and more volunteers. A rider comes in with their bike, a ticket writer fills in a ticket and uses a rack number a runner gave them, and a runner runs the bike to the rack and parks it. At this scale that led to a lot of yelling ("Rack number please? ", "I've got 3 spots in C37!") and chaos (5 ticket writers year C37 and now we can't quite fit the bikes). Did I mention chaos? The second year we were up a little hill from the finish line and a short walk from the main festival; and we parked about 1,500 bikes, but also handled bag check. I think the distance and visibility is why even with many more riders we didn't park many more bikes. We did a bit of having somebody go and write down rack numbers on tickets for empty spots which involved less yelling and chaos, but there was still plenty of chaos to go around. This third year we were looking at a spot directly next to the finish line set up to easily guide finishing riders directly into the combined valet bike parking and bag pickup line. We were also being given a smaller space than before so that it could be next to the finish line. And being asked to handle the flow differently with walking people to the bikes so that they exit via a different spot than they enter. The combination of probably many more bikes and less space was greatly worrying. I was thinking we might get as many as 3,000 bikes and was figuring that at best we could fit half that many bikes in the space. Efficient use of the space and re-using spots as soon as they're empty was essential! Additionally, the person who's usually in charge of these things was actually leaving the day before to go on a 5-day fundraising ride. She'd be helping with planning and setup, but wouldn't actually be there the day of. First, we used Google Maps to get a rough idea of the space. Also went on site to look around at things. The new space is definitely smaller, but also flat and fairly regular. There's a couple speed bumps and also a few curbed median things on one side that will block placing racks. One side is a wall at least 10 feet (3 meters) high that helps make our security perimeter simpler. I took the rough measurements and worked it out to about 17,000 square feet (1600 square meters). It's not obvious from these map pictures, but the divider down the middle of the parking lots has 2 gaps. Our first plan was to use one as an entrance and one as an exit. Use some fencing to control the lines (keeping people from walking across the finish line next door), and a station at either end for somebody to watch our perimeter. One end would be where the bag check was. With further talking with the Bike Monkey folks, they really wanted a single entrance and flow for both bike parking and bag check, so that people pick up their bag at the same time and place that they drop off their bike. Entrance would be at the top with the two gaps both used as exits, because that works best with the flow they've got set up outside our area. And in the morning there would be multiple "satellite" bag check areas with bags moved into the main space after the ride starts. I also started trying to work out some math, both to figure out how many bikes we can fit and how to fit as many as possible. The racks were actually from a third party, the Vineman Triathlon folks. They've got new racks this year. There was some back and forth discussion and we were able to verify that the racks are 10 feet long including the legs (the old style racks lose more space to the legs). Unlike our racks, they don't have a base, so they should be able to straddle a speed bump if necessary. Our space is 299 feet long and 59 feet wide. But we need some space at the front for the entry and space at the back. So real space usable for racks is more like 270 feet by 59 feet. The plan then is to preprint tickets for each rack+seat, and then have somebody at each exit collect tickets as bikes leave and copy the rack+seat to a fresh ticket that gets sent to the entrance. To my mind this is almost like a multi-threaded computer program. A fresh ticket is a reservation for a place a bike can go. A ticket writer at the front has a pre-pulled set of reserved spots and sends (via runner) those bikes to the spots. When a bike leaves, the used ticket halves are reattached to each other, the identifiers for that spot are copied to a new ticket and that reservation is now open again and sent back up to the front to be sent out again. On Wednesday, all the rack tickets were printed. There was some trouble figuring out how to make software work the way we wanted, so the closing time was pre-printed, but each ticket just had a "rack" and "seat" spot and those were handwritten on all the tickets. Part of the bag plan was to use the back area for some bag intake, so we reserved the tickets for those areas to be "released" once bag intake was done and those racks could be set up. We also reserved all the 7th and 8th "seats" on racks so that we didn't have to deal with trying to squeeze that last bike onto a rack unless we were really almost all full up. The primary rack setup happened on Thursday during the day, with vineman folks and some other volunteers. I came along at the end of the day, helped with a few last-minute setup decisions (exits weren't precisely measured on diagrams I had so there were minor adjustments), got counts and measurements for the final map that's above, etc. Got a chance to take a few pictures, verify exactly where exits and entrances were, etc. I could see that it's difficult to tell a 7 foot aisle apart from a 9 foot aisle, so one of our plans (if it wasn't already; I forget) was to use some chalk to mark things out. To help with navigating the colored sections, in addition to our usual "A1"/ "E33" type rack labels, we'd use some of the same paper as the tags were printed on to color code the racks. I took part in this year's World Naked Bike Ride. The ride is a celebration of cycling and the human body and also aims to highlight the vulnerability of cyclists on the road. At the Southampton ride there were about 150 riders, which is a pretty good turn out for a cold Friday evening. The dress code was "bare as you dare"--some dared more than others. We rode around Southampton and got an overwhelmingly positive response from car drivers, pedestrians and other onlookers. We managed to get some favourable media coverage and hopefully we helped raise the profile of cycling a little. The 2012 World Naked Bike Ride will take place in March in the Southern Hemisphere and in June and July in the Northern Hemisphere. More details are available at www.worldnakedbikeride.org. This is a community blog for Bicycles Stack Exchange. More community blogs are available at Blog Overflow. This is the companion blog for bicycles.stackexchange.com, a no-nonsense bicycle enthusiast Q&A built by users. Instead of wading through a lot of random discussion to get to the good stuff, the best answers are always voted to the top! Bicycles is one of many sites on the Stack Exchange network that synthesizes the best aspects of wikis, blogs, and forums, in a way that results in almost all questions getting great answers, often stunningly quickly. You don’t have to register, but if you do, you collect reputation points for your great answers and establish yourself as a top bicycle expert! But don't take our word for it; below are examples of questions that have gotten great answers. Want to write a post for this blog? It's easy! Post to this meta thread, and we'll get you started. Don't know what to write about? Feel free to pick from this list of ideas for blog posts. How do I change a road bike into a commuter bike? What are the disadvantages of “puncture proof” (or puncture resistant) tires? Why do cyclists prefer messenger bags over backpacks? McKenzie Pass Scenic Bikeway, Car Free! Are you ready to ride your bike through the winter?